The differences between solar panels are astonishing. But most are hidden from the public. Most dealers and manufacturers have a vested interest in pretending either that all panels are the same (so just let the dealer choose for you), or that their panels are better than they really are. They tell you that efficiency doesn't matter - but it usually does, and sometimes a lot. They tell you that you can tell how much electricity panels generate by their rated DC output in watts (under STC - "standard test conditions") - but you definitely can't. They ignore or blur the difference between power output and energy production - but this is the crucial difference that matters for residential solar. They tell you that all that you need be concerned with is the "price per watt" of panels - but that is a hopelessly distorted and misleading spec. This leads consumers astray. They buy the wrong number of the wrong brand of panels from the wrong dealers, forfeiting much of the savings solar could give them. This article supplies more in-depth information about efficiency, output, and prices of panels to supplement the main treatment of solar panels in the Solar Buying Guide - Step 2: What Equipment to Get - Size, Brands, Models, & Price. In that Buying Guide you find all the information you need to decide on equipment, pared down to the minimum that will ensure good decisions. The article explains solar panel efficiency and output. It concludes with a price comparison between two fairly similar systems. This shows the surprising effects that efficiency and first-year energy production have on your true costs. The system that starts out the least expensive ends up being the costliest. 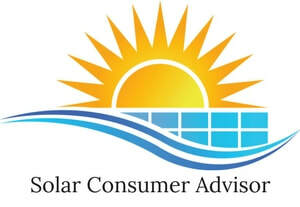 The Solar Buying Guides and web pages use as an example some typical homeowners whose SCE bill averages $200 per month. On the page Is 5kW the Right Size System for You, these homeowners decide to get a PV system that would reliably produce 10,131 kWh/yr. (using the recommended 10% cushion to be on the safe side). If the system is to be installed on a house that's about average suitability for solar, with moderate shading (19%), 10° roof pitch, facing 250°, then a top-quality system would have to be of size 7.604 kW STC (Standard Test Conditions) rated DC power. If you used the best-quality, highest-efficiency panels (22.2%), you'd need 22 panels to zero out your SCE Bill. The size of the array of panels would be 368 sq.ft. of roof space. Under optimum conditions, this system could be installed with as few as 24 mounts. On the other hand, the lowest-quality panels are rated at 13.8% efficiency. In addition, under real-world conditions, they actually produce 24.1% less energy than best-quality panels of the same rated output, regardless of efficiency. Therefore, you'd need 79 of these low-quality panels to zero out your SCE bill, requiring 1,112 sq.ft. of roof space (over 3 times as much) and probably at least 200 mounts that penetrate your roof - each one of which is a potential source of roof leaks. You also need clearance and walkway space around the sides of the system. The best-quality, high-efficiency system would need 550 sq.ft. of roof space, while the poor-quality, low-efficiency system cited would need 1,436 sq.ft. free of chimneys and vents. Your roof might not be big enough. If you don't have enough suitable roof space, the first part of the solution is to use the highest-efficiency panels. Otherwise, you'd have to settle for a system that doesn't eliminate your SCE bill, thereby wasting substantial savings. In shopping for solar, it's also worth looking down the road 10, 20, or more years. You may want to expand your system in the future, to accommodate electric cars, for instance. That's why it's prudent to consider your roof space as an asset, not to be wasted on inefficient solar panels. The percentages shown below are the differences in first-year energy from the worst to the best panels, even though they have the exact same STC power rating. ■ PTC power (more realistic) versus rated STC power (idealized): up to 7.1%. ■ Anti-reflective glass (some have, some don't): up to 3%. ■ Reduced performance under high temperatures: up to 4%, or even 8% in SoCal. These add up to 21.1%, but when actually combined as "system losses", they have a total effect of 25.9%. ** When this difference in system losses is combined with the other differences between systems in the well-respected PV Watts calculator from the National Renewable Energy Laboratory, the best system of the exact same power rating (STC) would produce 31.7% more than the worst system. Similar calculations show that the best panels would beat average panels on these five factors by 15.4%. They would beat even the 2nd best scoring panels by 10.1%. This may not sound like a lot, but it adds up to differences in savings of many thousands of dollars. In addition, top-quality panels perform much better than others in partial shade. All in all, when you compare apples to apples - systems that really produce the same amount of energy in the first year alone (leaving aside differences in degradation over time), the best quality system is liable actually to be a bit cheaper than the 2nd best quality system, and considerably cheaper than average or worse-than-average systems! These drastic differences among panels with the same STC power rating make it almost impossible for most vendors, let alone consumers, to get an accurate estimate of a system's first-year energy production. This causes four problems for PV shoppers. The first problem is that few solar vendors allow customers to choose specific brands or models of equipment, or even tell their customers what brands or models their system will include until after it is installed. Even if the quote lists brands and models, it usually allows the vendor to change equipment up to the time of installation without your OK. That allows vendors to install whatever is cheapest for them at installation time. That partly explains why most vendors insist that all equipment is the same. This state of affairs makes it nearly impossible to shop intelligently for a system. You can't specify the equipment you want, and you don't even know what you'll be getting until it's too late. The second problem is that most vendors' annual-energy predictions on quotes are unreliable. It is getting more and more widely known that these predictions are often wildly overly optimistic. Scandals and lawsuits are brewing. *** Forecasting how much energy a system will produce on a given house is difficult for manufacturers and even more difficult for vendors and installers. Most vendors sell a wide variety of panel brands and models, each differing in many specs. But the software they use to estimate annual energy accepts inputs for some, but not enough, of the characteristics of these panels. In addition, manufacturers and installers have a vested interest in exaggerating the annual energy production of the panels they sell, so they can sell a smaller system with a lower price but inflated predicted energy. How about calculating first-year energy yourself? This is the third problem. Even if you know what equipment you're getting, it's nearly impossible to predict how much energy panels will produce on your roof. That's because to use a reliable estimator like PV Watts for specific panel models, some of the inputs you'd need just aren't available to consumers, or even to manufacturers or installers. You could be off by up to 31.7%. But surely, you say, a customer can rely on the manufacturer's and installer's warranties and production guarantees to protect against a possible energy shortfall. No, you certainly can't. This is the fourth problem. Warranties are only against defects in workmanship. They don't even claim to protect you against exaggerated estimates of first-year energy production. Most purchased systems come with limited power-guarantees, which offer some protection against each individual panel that isn't defective but for some other reason is way down in power output. That's not the same as the system being deficient in first-year energy production at all. Only leased systems offer an energy-production guarantee - the kind that could really protect you - but you're unlikely to benefit much by it. This is all explained in full in the article called Solar Warranties, Guarantees, & Insurance. brands and models they're getting until after installation. 2. Most vendors' predictions of your annual energy are off; many are wildly so. 3. There is no way you can double-check first-year energy for most panels. 4. Warranties and guarantees don't offer much protection against energy shortfalls. How can consumers solve these problems? 1. Get quotes on the equipment brands & models you want, guaranteed to be installed. near the top of the 31.7% range. 3. Get panels whose annual-energy production you can double-check yourself. 4. Get the best warranties & production guarantees, even though of limited help. How to implement these solutions is found in the Solar Buying Guide - Step 2. Many solar shoppers are interested in what's been happening and will happen to solar prices. Actually, the difference in price between PV systems is really not a very significant factor in your overall savings with solar: true production, efficiency (roof space), quality of the equipment, reliability, durability, rate of degradation, installation quality, and financing are all more important than relatively small differences in system price. And as the sections above illustrate, price per watt of STC DC output is utterly meaningless. For the first six months of 2017, the average system price in Los Angeles, Ventura, and Orange counties was a bit over $26,000, or about $18,300 after deducting the 30% ITC. It was about $2,000 higher in San Bernardino county and the Inland Empire. These prices represent a drop of about 3.3% from 2016, which had dropped about 5% from 2015. The average size of a system, as usually specified in kW STC DC, in L.A. and Ventura counties has also been rising slightly over the last few years. In 2017, it was about 5.8 kW STC DC. The $18,300 L.A. and Ventura net prices (after ITC) are almost exactly the prices of the systems we recommend for an average SCE customer with an annual bill of $2,400 (averaging $200 per month). This is for a system of 5.7 kW, so almost exactly the average. But the systems we are recommending are the best in quality, with the best installation and warranties, financed optimally, so this 5.7 kW really produces up to 31.7% more electricity per year than a poor quality system would. That is, 5.7 kW of best quality produces as much as 7.5 kW of poor quality solar. This shows that if you do solar right - get the right equipment and right size for your needs, have it installed well, and finance it optimally - your system price will still be just about average. You don't really have to pay more for top quality, contrary to conventional wisdom. Here's a real-world example of quotes for 2 systems using panels of different efficiencies and quality. The first system used top-quality, high-efficiency panels and other components. The second system used panels of 2% lower efficiency. Its panels and other equipment falls into the second rank of quality - not bad, but not the best. Because of higher efficiency, two fewer panels were needed for the first system than the second. The quotes for both systems predicted almost exactly the same annual energy, about 12,000 kWh/yr. But this energy estimate was accurate for the first system, while overly optimistic for the second. When recalculated carefully, it turned out to be 6.7% too high, meaning that it would realistically produce only 11,246 kWh in the first year. The second system cost almost exactly $6,000 less in gross price than the first system. After deducting the 30% federal Investment Tax Credit ($1,800), the difference was reduced to $4,200 - still significant. But factor in that 6.7% in exaggerated energy production for the second system (and it could easily be more than that) and the cost of the second system actually goes up by $4,900 over 20 years. That would make the first system actually less expensive by $700 ($4,900 - $4,200). Further, the lower-quality panels degrade faster than the top-quality ones. This would waste $3,700 more in SCE savings over 20 years, raising the first system's advantage to $4,400. These advantages would only get larger after year 20, and this is leaving out the greater reliability, durability, aesthetics, better warranty (twice as long) and production guarantee of the higher quality system. This is a typical example of how a system which appears to be cheaper initially turns out to cost more overall. For a complete guide to all the factors to consider to decide on what solar equipment to get - size, brand, models, and prices, please see the ​Solar Buying Guide - Step 2. * Photon International, November 2012. ** National Renewable Energy Laboratory (NREL), “PV Watts Calculator,” updated April 22, 2016. **** Some panel manufacturers are pushing PERC panels recently (Passivated Emitter Rear Cell). They are available in monocrystalline silicon or polycrystalline silicon. The poly version is low in efficiency, but the mono version can be competitive with standard monocrystalline silicon cells. The main advantage as of now is slightly lower cost, but the drawback is worse LID (light-induced degradation) - up to 4.7% in high light and up to 4.3% in low light for the mono versions, according to "Light Induced Degradation of P-Mono PERC from Ingot, Cell, Module to System," Chang, Maoyi et al., 32nd European Photovoltaic Solar Energy Conference and Exhibition, 2016. ***** Millstein, Weiser, Bolinger, Barbose, "The Climate and Air-Quality Benefits of Wind and Solar Power in the United States," Nature Publishing Group, Aug. 14, 2017.